Suffering from meeting fatigue? Word-heavy PowerPoint slides got you down? Our clients are right there with you. That’s why they come to us ­­– our live drawings bring energy and excitement back into the conference room, trade show booth, and general session stage. 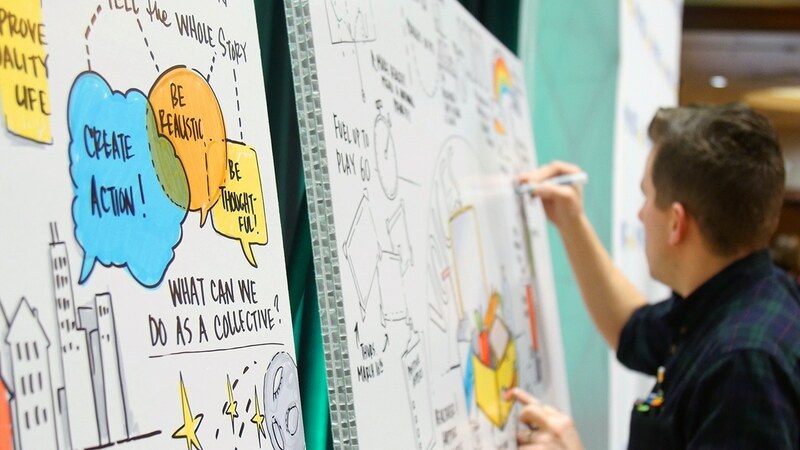 We know that visual notes are a powerful tool to inspire and engage your audience and a great way to make sure that people remember your content long after your event. When combined with the audio stimulus of a presentation, speech, or lecture, visuals have a powerful impact on memory retention and recall. Graduate students at the University of Wisconsin-Madison found that “visual stimulation is more effective than audio stimuli at achieving higher memory retention and recall,” and “specifically, it seems that the use of visual stimuli with the act of writing seems to elicit the best recall” (Udomon, et al., 2013). Because words can often be abstract and difficult for the brain to retain, visuals are a more concrete and easy way for people to remember your content––a concept in psychology called the Picture Superiority Effect. People “remember 80 percent of what they see and do, 10 percent of what they hear, and 20 percent of what they read” (Lester, 2006); so, unlike text, visuals stick in our long-term memory. One study found that participants who viewed only text remembered 10 percent of what they read after three days. But those who viewed text paired with visuals remembered 65 percent of the information three days later (Medina, 2008). Want people to actually remember what you tell them in your presentation? Use visual notes. How often do you get to see an artist at work? Now, how often do you get to see an artist at work visualizing what you just said? When our skilled artists step into a room and put marker to paper, people are inspired. Not only do they get to see what is being discussed come to life real-time with visuals, but they get to see their input reflected in the final drawing. They are able to connect with your content on a higher level, retain and recall what was just said well beyond the event, and continue to be inspired by the visual we created. When you are sitting in a content heavy meeting it is easy to get distracted and for your mind to wander. Previously criticized as a sign that students aren’t paying attention in class, a study found that a group who doodled during a monitoring task recalled 29 percent more information than the non-doodlers (Andrade, 2009). Research further suggests that even the simple act of doodling can help alleviate boredom, keeping the brain from entering a daydreaming or “idling mode,” which helps individuals stay focused during an otherwise stimulating activity (Schott, 2011). 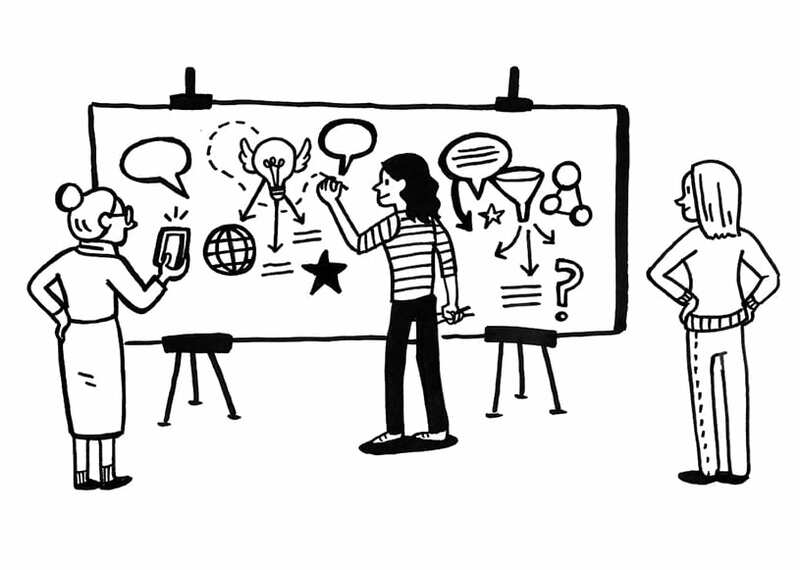 Engaging a visual note taker for your next meeting can help those wandering minds by providing a visual outlet. This will help keep everyone interested and keep their minds from drifting. In an increasingly visual world, where PowerPoint presentations are usually considered too wordy, audiences are clamoring for ways to better digest the large amounts of information presented to them. Our visuals help simplify the engagement process by allowing information to be easily retained and recalled. 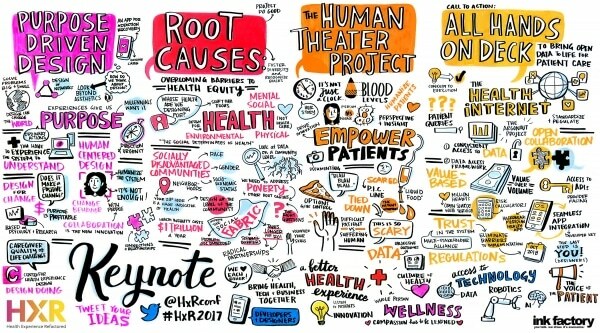 When created in real-time in front of an audience, the process of visual note-taking further enhances this engagement and allows the participant to feel energized and inspired. Not to mention that the hand-drawn look of our visual notes contrast strikingly with traditional templated PowerPoint designs. Don’t let people leave your event just to have everything they learned vanish from their brains the next day. With visual note-taking you walk away with a physical archive of the final output, as well as a digital capture of everything created. Hang the physical copy of the visual notes in your office. Send an email with the digital copy from your session. Send out postcards of the visual notes. Use them on your social media to reignite the conversation. There are so many ways to use these visuals beyond your event, and our visuals are the perfect way to remind people of your brilliant ideas.